If you like this free game, try Vikings: War of Clans. 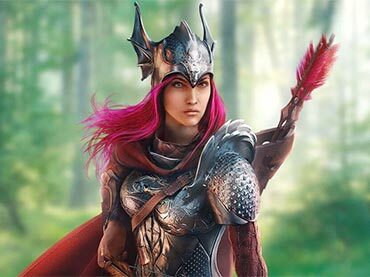 Similar to Vikings War of Clan, Throne kingdom at war is a real-time strategy game developed by Plarium llc. This MMO game is quite similar to, Vikings War Of Clan. The story begins with the passing on of the late Emperor. His death has caused the empire to be in chaos with divided loyalty amongst the people. Every player is a lord with different purposes. Some lord seeks powers while others fight for peace. In order to become a powerful lord to support what you believe in, an army of strong warrior is needed your conquest. Throne Kingdom brings you to the battlefield where blood was spilt and lives are lost. Focus on strengthening your army and build the resource required to support your battle and your kingdom. No matter the purpose, the main objective of every lord (player) is to own the strongest kingdom within the empire. For that, they will need a powerful army with an abundance of resources. In this browser game, form your formidable army of knights and spearmen, warriors and cavalry to conquer enemy kingdoms. As your kingdom expands, resource management also becomes really important. Unlike other MMO game, Throne Kingdom allows you to battle it out with PVE (player vs environment) and PVP (player vs player). This means you will have double the excitement in this traditional war game. Like all real-time strategy games, you begin the game with a small kingdom with a few basic structures. A kingdom that is struggling with a lack of resources. In the earlier games of playing throne, you will follow a guided quest with the NPC's helpful guidance. After a few quests, she will disappear and you are on your own. While playing, you will observe that the quests are broken down into 3 main part. The building, warrior training and conducting studies (tech tree). In fact, the whole gaming experience is about building, resource management and conquest. In the early game, buildings were built by speed. The building will be free if you can have them built within 5 minutes in your early level. As you proceed with helping your people in building both resource buildings and administrative buildings, the state of the kingdom will be greatly improved. The resource building will produce the basic necessities that are crucial for your people's survival. The administrative buildings, on the other hand, allow you to improve resource gains, train units and modifying pieces of equipment for training needs. As you dive deeper into the game, you can upgrade these buildings and build a stronger army. Players get full control over where their resources should be spent. This includes research upgrades which could improve the stats of their army and their towns. When you start playing Throne Kingdom at War, you will realise that it has excellent graphics. The colourful scene was adopted from the middle age of western Europe and the drawings of the characters are highly detailed. The Graphics are stunning with flowing water and marching soldiers within the kingdom which gives life to the town. You will also notice that the graphical animation looks fantastic. They follow in the style of their earlier games, Stormfall Age of War and Vikings war of clans developed by Plarium llc. - When playing throne, always keep yourself busy with the quest. There are plenty of quests available that will help you increase in your level for faster progression of the game. - Joining an alliance (order) will gain you different bonuses. Being alone in this game will make you an easy target. You will be conquered in no time. - Rewards can be claimed anytime. You can always stockpile them in your “Quest” tab and use them when you really need them. - It will be good if you always have these scrolls with you. You will need them when you start fighting other alliances (orders). - Do not let your troops idle. Always make sure your troops are always farming for resources or else, they will passively consume food while resting. - Regularly check your game as you receive a freebie every 8 minutes. In conclusion, if you are a MMO game fanatic, it will be worth checking out on Throne kingdom at war. The gameplay will be rather similar to a typical MMO strategy games. Yet it does pack with quite a number of challenging war battling actions. The overall graphic is decent in this game. If you are looking to try out a new strategy game with a good storyline, you should download this FTP game by Plarium llc. This free download is made available in GameTop. If you have questions about Throne: Kingdom at War game, please contact us using this form.